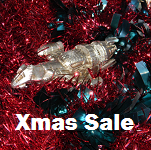 New Melbourne Browncoats, Inc. | Our Christmas Sale Has Begun! Our Can’t Stop the Serenity donation to Equality Now is in! Give the Gift of NMB Membership this Christmas! We’re having our first ever Christmas Sale! Head on over to our online store to grab a super shiny gift for yourself or the Firefly fans in your crew! There’s a great range of goodies, including t-shirts, posters, books, DVD/Bluray, autographs, keyrings, decals, statues, bookmarks and much much more! And best of all, proceeds benefit FareShare and Fitted for Work! The sale runs throughout November (though it will be offline while we’re at Supanova Adelaide).